I wandered over to the tiny 9th Avenue and 57th Street farmers market this afternoon and picked up some bok choy, apples, and tri-color pasta. Particularly crisp looking, the baby bok choy looked beautiful and fresh. Chicken: Cut chicken in 1 inch strips. Dice onion. In a bowl, Marinate sliced chicken with sherry, soy sauce and diced onions for at least one hour. Heat canola oil in a wok or heavy bottom saute pan until oil begins to bubble. Add chicken and stir until cooked through. Set aside. Reheat when ready to serve. 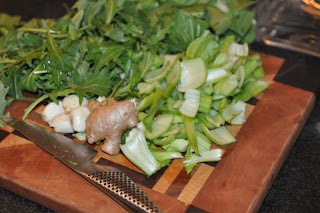 Greens: Chop 4 cloves of garlic and grate 1 teaspoon of ginger. Add garlic and ginger to the pan and heat the toasted sesame oil in a wok or heavy bottom pan over a medium-high heat, add bok choy stems and saute until begin to become transparent, add bok choy greens and mizuna and stir until just wilted. Serve Hot. Plate the dish with a mound of rice topped with a generous portion of greens and chicken pieces. Bok Choy is a Chinese vegetable that was introduced to Europe in the 18th century. It's a cruciferous vegetable and a member of the cabbage family and, similar to cabbage, bok choy is packed with nutrition. Rich in Vitamin C and fiber and a good source of folate, bok choy has a heavy dose of beta-carotene for cancer prevention and eye health and calcium for healthy teeth and bones. Low in calories, eating bok choy is like getting two vegetables in one with its crispy stalks and tender leaves. Also a cruciferous green, mizuna is an attractive, mild, and tender with a light peppery bite which is somewhat mustardy. Can be sauteed or eaten raw in a solid. Rich in Vitamin C, fiber, folic acid and antioxidents, mizuna has a similar health profile to bok choy and other vegetables in the cabbage and mustard family.